Congregation Judea- Chabad provides the education and means to promote Jewish awareness, knowledge and practice through outreach, education and social services ensuring Jewish continuity. We are part of the worldwide Chabad Lubavitch Movement. Chabad Lubavitch branches are present in every major Jewish city in the world. Chabad Lubavitch worldwide is dedicated to serving Jews of all ages with Ahavat Yisroel regardless of religious background or affiliation. Uniquely each location is funded individually from its own fundraising campaigns and charitable giving of individuals. Your support helps us continue our vital work, reaching thousands of Jews in our area. 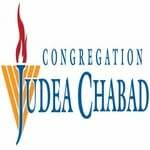 Congregation Judea serves all segments of the Jewish population. Parents are encouraged to bring their children to synagogue. Everyone is welcome regardless of their personal level of observanceCongregation Judea- Chabad provides the education and means to promote Jewish awareness, knowledge and practice through outreach, education and social services ensuring Jewish continuity.